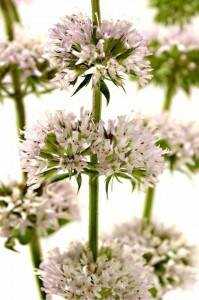 Mentha aquatica (Chocolate Mint) was simmered in vinegar to combat dandruff. Infusions were traditionally used to soften, and also relieve itching sensation due to dry, cracked, problematic skin. Its astringent and cooling effect was beneficial for insect stings and bites. Compresses were used to alleviate sunburn. The pulp of the fresh plant was applied to bruises. Of course, its aromatic fresh scent was used for deodorizing properties and for scenting toiletry goods. Mint is known to counteract drowsiness and fatigue by increasing alertness and clear thinking. It calms and soothes muscles, particularly those of the digestive tract. Mint eases motion sickness and nausea. It was also known to give relief to headaches and to clear sinuses. Chocolate Mint oil and extracts should not be used by women who are pregnant or nursing, and should not be used on young children. Chocolate Mint Essential Oil should be diluted before use.